Your Voice was produced by Matt Engle at Musi-Tech Studios in Redmond, OR. It features an all-star band including Doc Marc Sackman on flute and sax, Matt on piano, bass, and lead guitar, and Steve Kuline on piano. 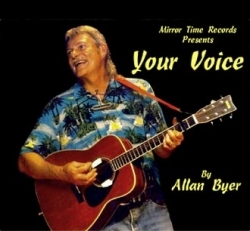 From Country Rock to jazz to Americana and Blues, this album covers the wide range of musical styles Allan works in. Kevin Lewis plays drums.